What is "An Intentional Creativity Workshop"
And can I bring one to my Yoga Studio/ Community Center/ Home ? How do we choose to show up and express in the moment? How do you consciously and unconsciously communicate what you stand for? 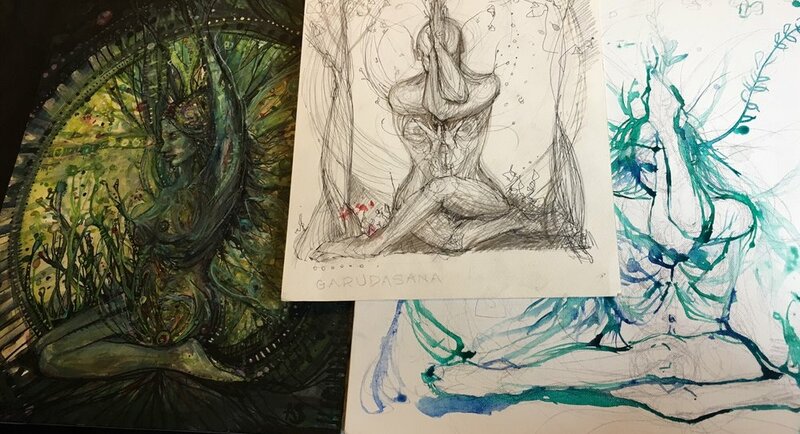 In this workshop, within the Yoga pracitce & Art medium of your choice, you will have the opportunity to offer up a physical, mental, or emotional pattern as fuel into the fire of creation, setting an intention toward the alchemical process of transformation. It is only by acknowledging and accounting for our experiences, our personal and cultural narratives, that renegotiation of the future and reframing of the present can authentically evolve. It is only within a community dynamic that healing, on the small, large, and systemic scale, can occur. The result of this process will leave you with pages of Art, meant to stand alone as a token of the experience, and/or to inspire you in the larger context of your work. This workshop is intentded for all humans open to exploration! Participants are asked to wear loose comfortable clothes for momevent, and to bring along a notebook and art supplies of the medium of your choosing. EMAIL: Amanda.Shafran@gmail.com to bring a AN INTENTIONAL CREATIVITY WORKSHOP to your Yoga Studio, Community Center, or Private Home. Can I take a public yoga class with you? I teach a blend of embodied, healing centered,, Hatha Tantra, Ayurveda Yoga & Meditation.. All of my classes are designed to support the context of the Seasons of natural world, as well as the internal, Mind/ Body/ & Spirit landscape of the individual. Are you accepting PRIVATE YOGA clients? Yes! I still work with a select group of Private Yoga & Meditation clients to hone and transform their personal practitces. Reach out to Amanda.Shafran@gmail.com for availability. Are you accepting custom painting commissions? Are you accepting FREELANCE ILLUSTRATION projects? I accept a select amount of Freelance Illustration projects that align with my values and mission statement. Please contact Amanda.Shafran@gmail.com for submissions and comissions. Can I liscence an existing image for use? Contact Amanda.Shafran@gmail.com for pricing and availability. Are you accepting FREELANCE COSTUME DESIGN / STYLING projects for Film, Stage, & Print? I accept a select amount of Freelance Costume Design projects that align with my greater mission statement. Contact Amanda.Shafran@gmail.com to start the conversation. Can we collaborate on a custom Mala or Crystal Touchstone? I accept internship applicants with a creative skill sets who are motivated, dedicated, and interested in exploration. Does this sound like you? an opportunity to have an up front experience of "creation of art towards a purpose", as a way of making, a way of living, and a way of building an authentic breathing business ! - assisting in design, assemblage, and marketing of "seasonal support box"
- curation of intentionaly creative, culturally aware, insta storytelling for each week. How can we work together to explore Art, Yoga, and Life ? or email Amanda.Shafran@gmail.com to curate a custom service.